The journal publishes original research articles on ancient and medieval philosophy. as well as review articles on books and conferences. 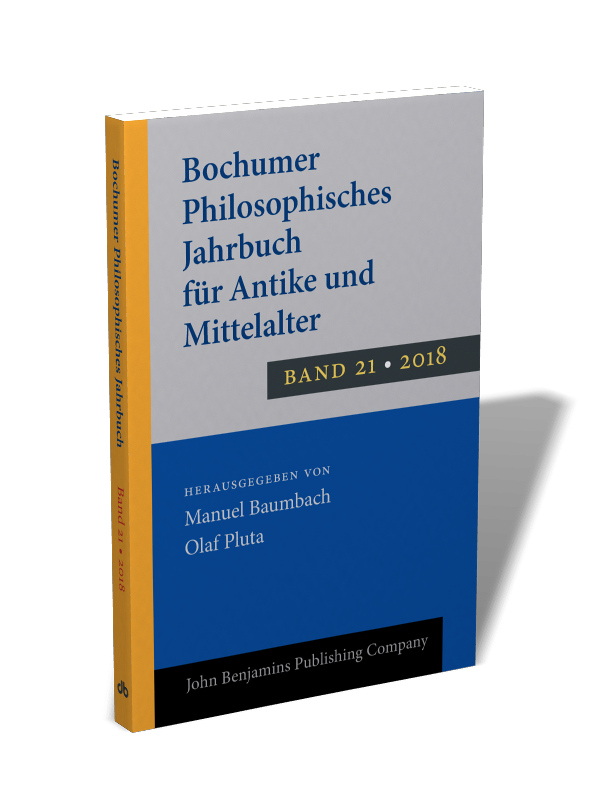 Volume 21 (2018) has now been published (@johnbenjamins) (March 22, 2019). The final manuscript has been sent to the publisher (October 23, 2018). The manuscript of Volume 21 (2018) has been finalized (September 26, 2018). Further information is available at: benjamins.com/catalog/bpjam. We are now accepting submissions for Volume 22 (2019), due out in late 2019. For book reviews, please refer to the list of available books. Before submitting your manuscript, please read our guidelines. The submission deadline for Volume 22 (2019) is May 31, 2019. The review process takes time, so please submit your paper early. Manuscript submissions and enquiries: bpjam-redaktion@rub.de. All rights reserved. Last updated: April 15, 2019 (webmaster@bpjam.net).